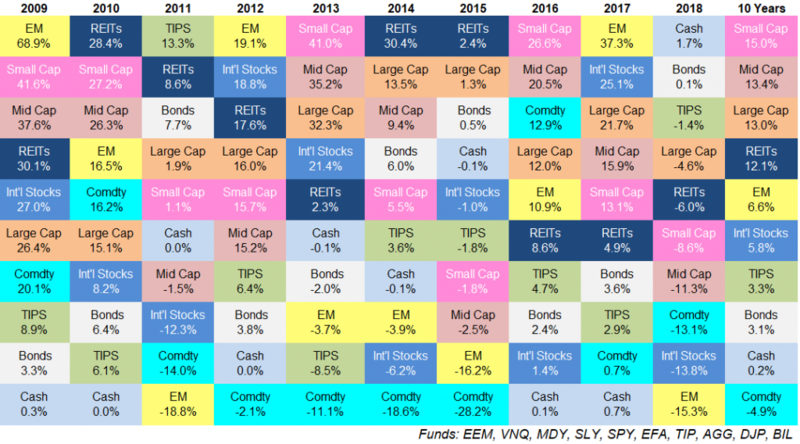 Asset allocation “quilt” charts, like the one here put together by investment blogger Ben Carlson, can help us make sense of the markets. This chart shows how different types of investments performed last year and over a 10-year period. For the first time in 10 years, cash deposits earned more than any other investment. Almost everything else lost money. (The second best performing asset class – the bond index – eked out a 0.1% return. Let’s just round down and call that a zero percent return). International stocks pulled down results even further. Developed market stocks (like Europe) lost almost 14%. Emerging markets stocks lost 15%. The average asset loss was 9.3%. Diversification protects you by evening out some of the highs and lows. Unfortunately, since assets did so poorly across the board, diversification would not have given you much protection in 2018. A diversified portfolio, containing a equally-weighted mix of assets, would have lost 7.2% in 2018.